For the second edition of Forgotten Project, we thought about an event format that could be held before the arrival of the artist. We wanted to focus the attention on the building itself. 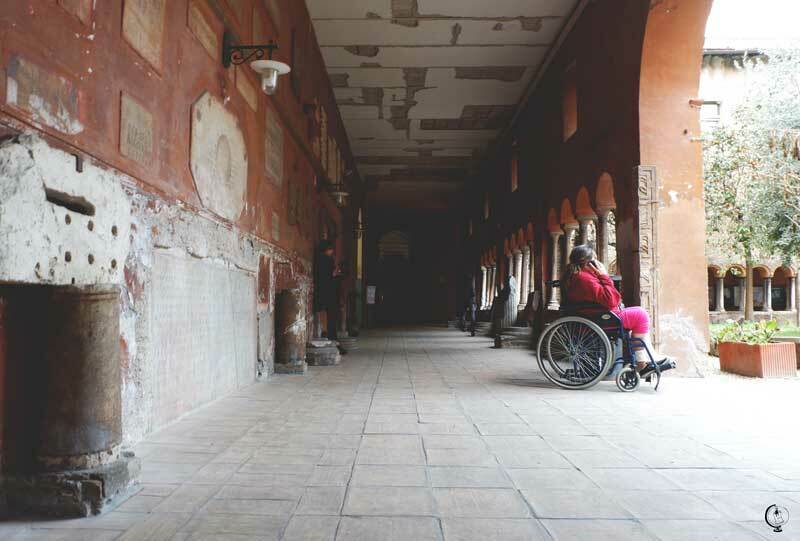 In this case, we had a walking tour through three forgotten hospitals in the city center of Rome: Santo Spirito in Saxia, San Gallicano and Nuovo Regina Margherita. We visited their charming courtyards, secret gardens and frescoed rooms that are usually closed to the public. The final stop of the tour was actually the hospital, on which the surrounding wall My Dog Sighs would start painting the next day. It’s a hospital from the 13th century, which has recently undergone some major functional changes. 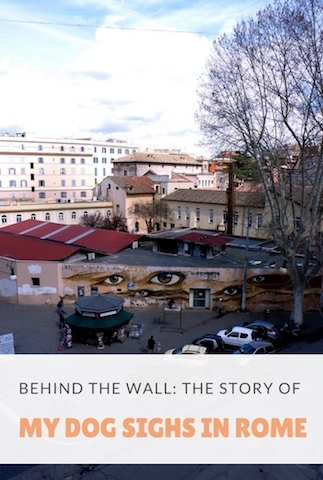 After the tour, over-excited for the upcoming adventure, we wandered around the city center until sunrise, stopping in front of the wall to celebrate the last day we were seeing it in the way we knew it. 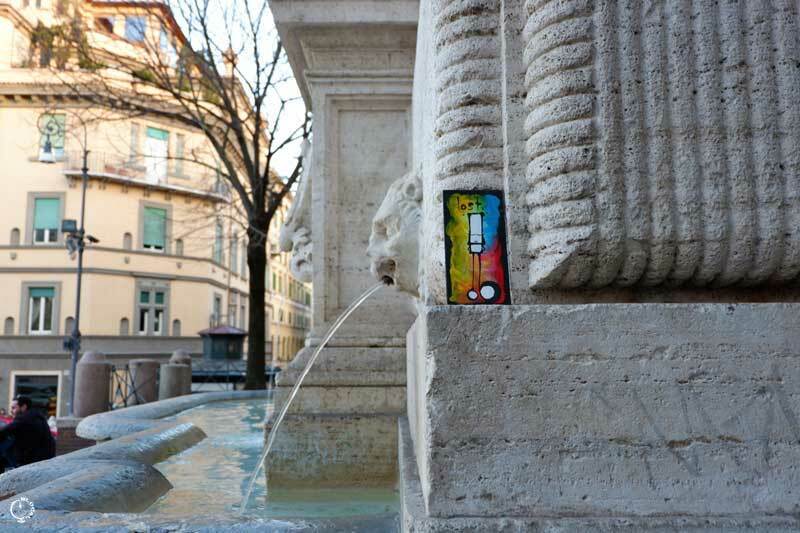 The next day, My Dog Sighs arrived in Rome. Nothing from that moment on would be the same. 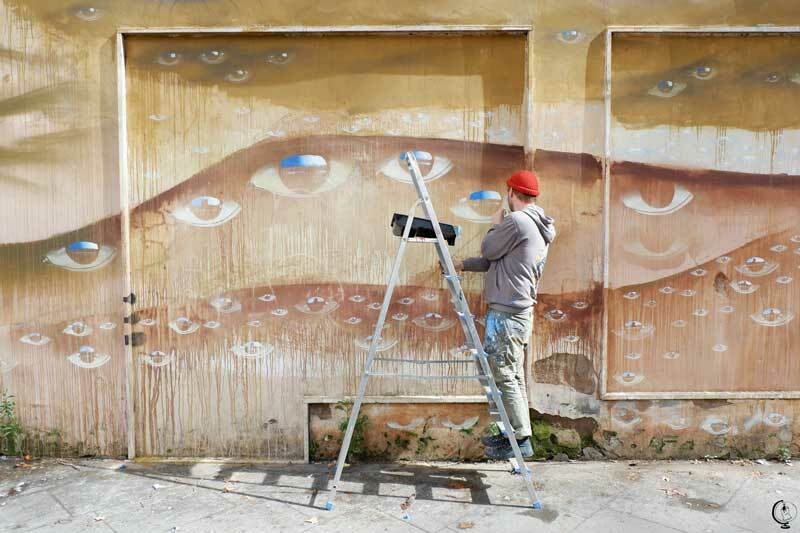 As soon as My Dog Sighs arrived in Rome, he went straight to the wall and began painting the background. He did his best to try to integrate with the environment. 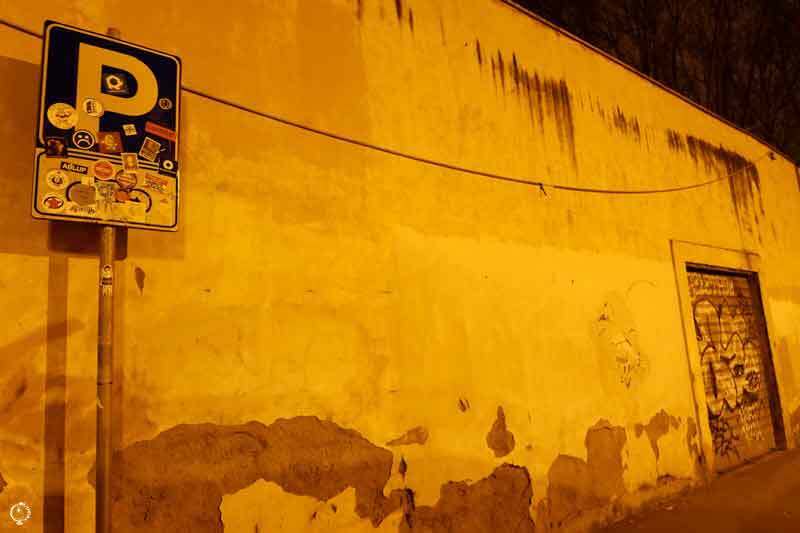 It was the first time that he’d painted such an old wall, and he really wanted his art to fit into the surroundings. In my opinion, the color palette that he picked is the most poetic thing about this mural! 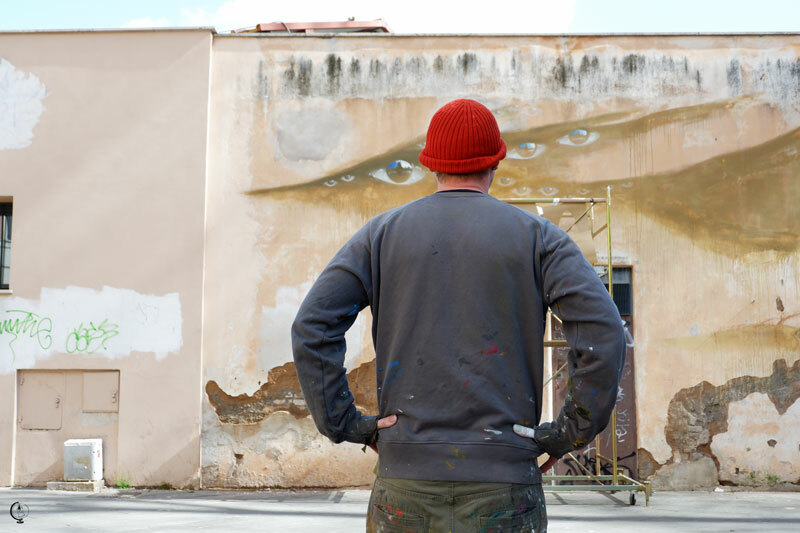 When he was in Rome, My Dog Sighs used some soft shades quite distant from his usual bright colors, which –in turn- perfectly suited someone like him. Someone who grew up as an artist looking up to pop masters such as Roy Lichtenstein, Andy Warhol and Jackson Pollock. 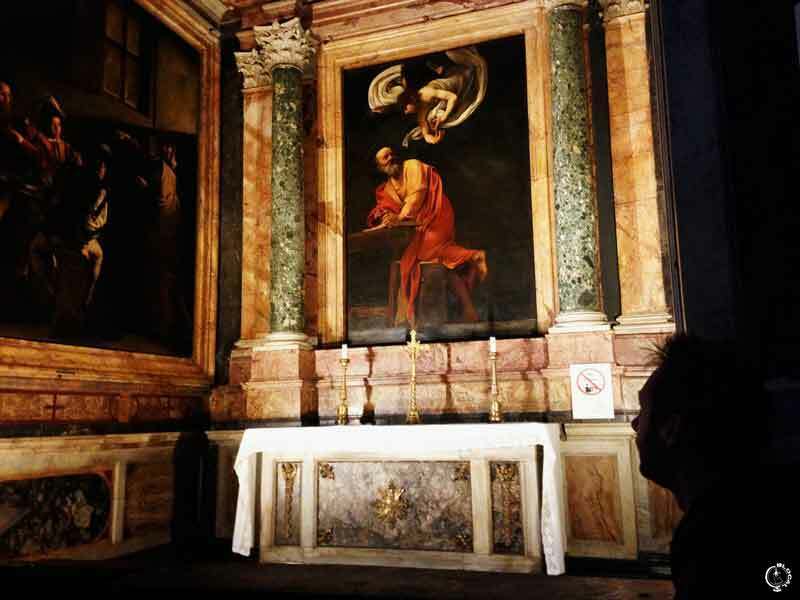 The colors he used in Rome, instead, are gentle and kind of romantically range from deep browns to vibrant ochres. “That brown up there is the darkest I plan to go,” My Dog Sighs told us on the first day, stressing that it was the first time ever that he was painting with almost no black. It was significant. On the first day, My Dog Sighs painted the waves that brought life to the wall. As his big brush was touching the surface, the paint was dripping down, like tears. I volunteered to help water the wall with a spray bottle, to blur the dripping paint and to continue wiping away the colored tears, even after actual rain attempted to take over my job. By the end of the first day, the whole wall was crossed by sinuous lines that looked like sand dunes that gave a mesmerizing illusion of movement. For having worked just half day -and under the rain, to boot- My Dog Sighs had already accomplished a lot. He worked hard on the background, eventually stopping to study the wall from different points of view and asking us: “Is everybody happy?” It made everybody laugh, since that happens to be my signature question no matter where I am. 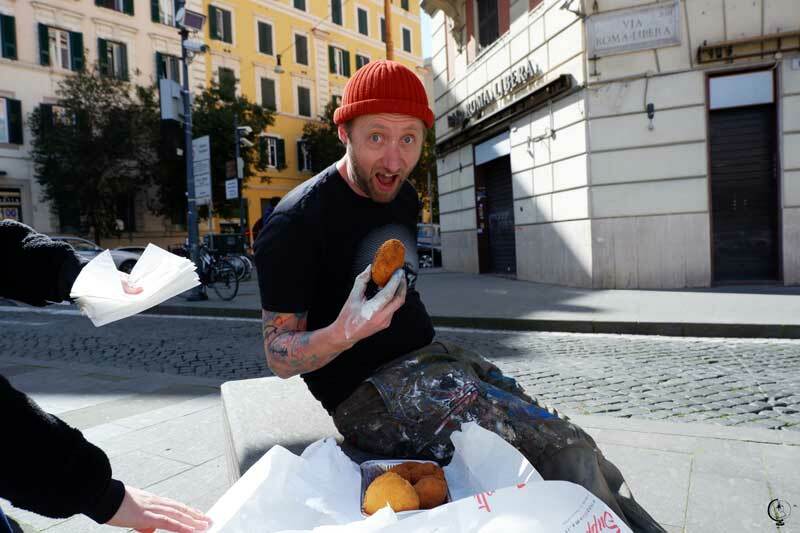 His first break also happened to be the first time he tried some authentic “Roman” food. He told us that his sons have been challenging him to eat pasta and pizza every day during his stay in Italy. My task for that week was to make sure that he’d achieve their ultimatum. 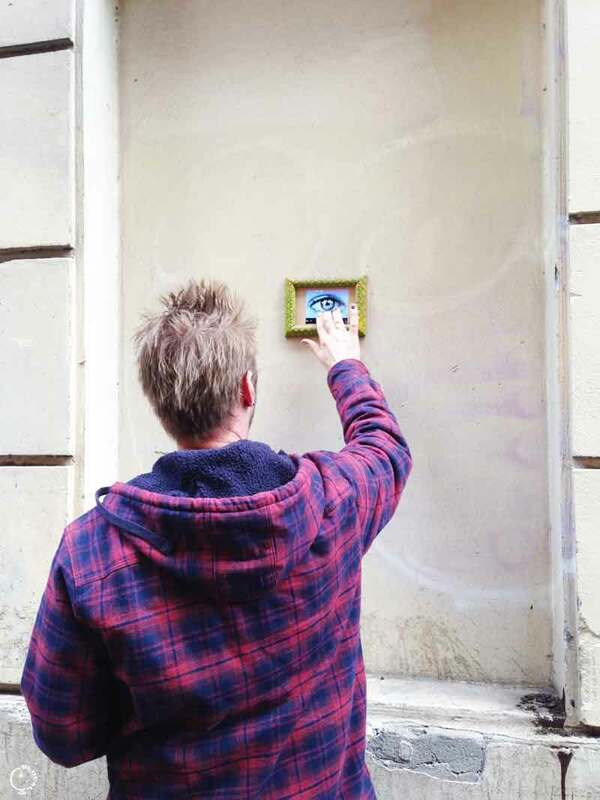 “I’m looking for people who have a connection with this hospital,” My Dog Sighs declared both on social networks and to the passers-by who stopped to look at him. “I need them to send me a head-and-shoulders photo to draw their silhouettes within the eyes.” Both on-line and off-line, My Dog Sighs connected with people that were born, or died, or worked in the hospital. 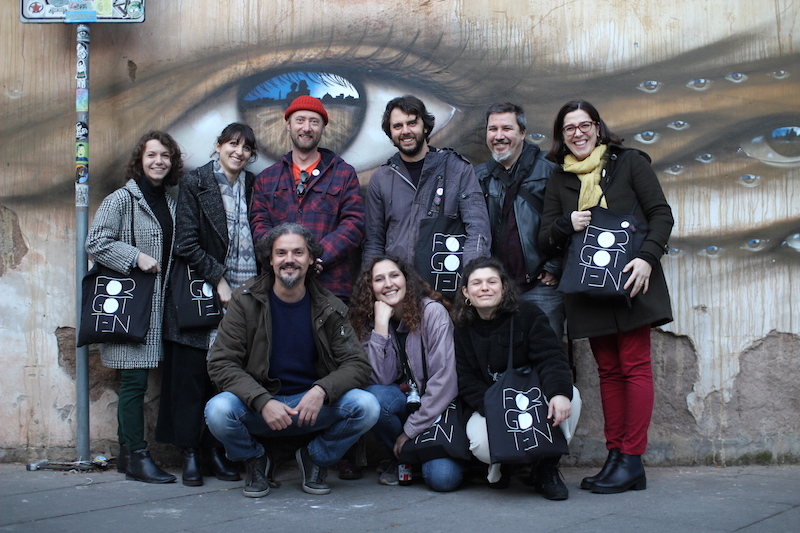 He made the mural a communal history, through their different stories. That’s the main reason why My Dog Sighs likes to draw eyes: he likes to tell different stories through the reflections within them. When he started out, he used to draw just his silhouette within his iconic eyes. Then he happened to spend a Father’s day painting apart from his sons and he drew their silhouettes next to his. It’s how he discovered that the reflections within the eyes are a perfect medium to tell a story – especially the stories he wants to tell. As for us, by day two we all were already so burned out that Alessandra, meaning to send the making-of video of one perspective to the sister of a girl portrayed within it, actually sent the video to all her contacts with a cryptic message saying “Here is your sister.” Given that she’s the curator of the Forgotten Project, her contacts included all council members, journalists and more notable people whose attention we were trying to get on those days. Suffice it to say, we kind of got noticed! The first thing we noticed about My Dog Sighs’ way of working is that he is very fast. On just day three, the dull, crumbling wall was a distant memory and all 540 eyes were already there. 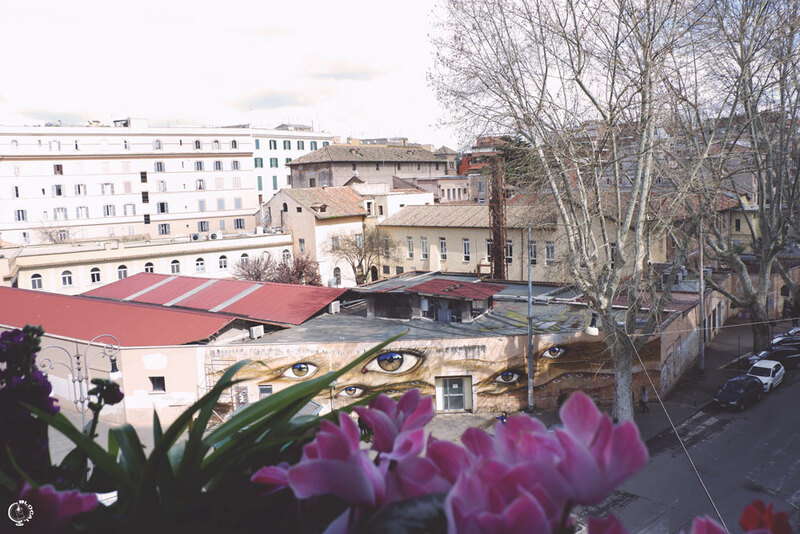 For the smaller eyes, My Dog Sighs used three different sized stencils with three different silhouettes and the ubiquitous skyline of Rome made up of domes, obelisks and iconic monuments. 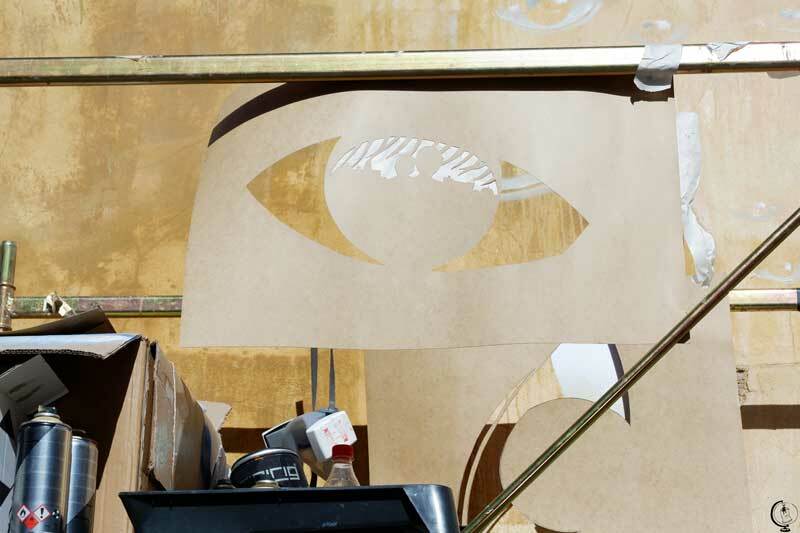 He stenciled the smaller eyes with different shades of white and then refined them with a brush. The white paint was for the highlights and the blue paint was for the sky within the reflections. 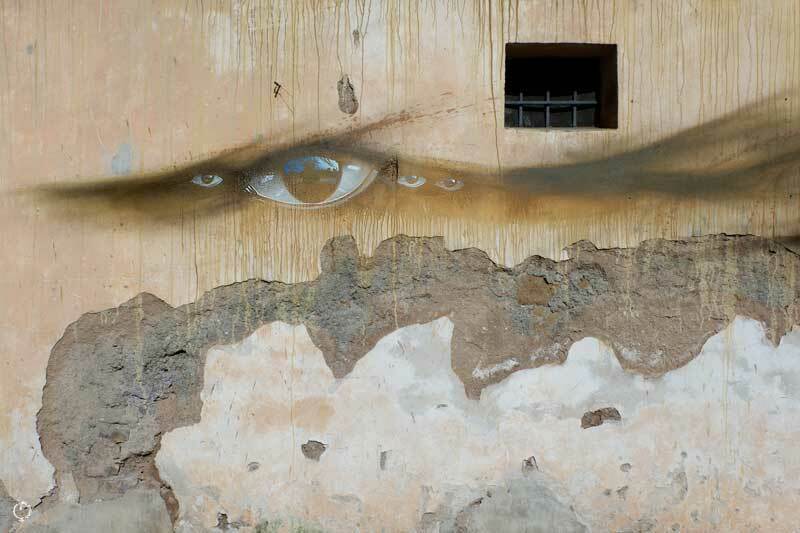 The big eyes, instead, are freehand: he drew the circle with the help of twine and then filled the different open areas with spray-can paint. Since the first moment I saw the wall, I was looking forward to seeing how My Dog Sighs would treat the many tags that were on it. What he did was beyond my wildest dreams. He left the tags on the twin rusty doors, only adding his iconic drops on them which was perfect. 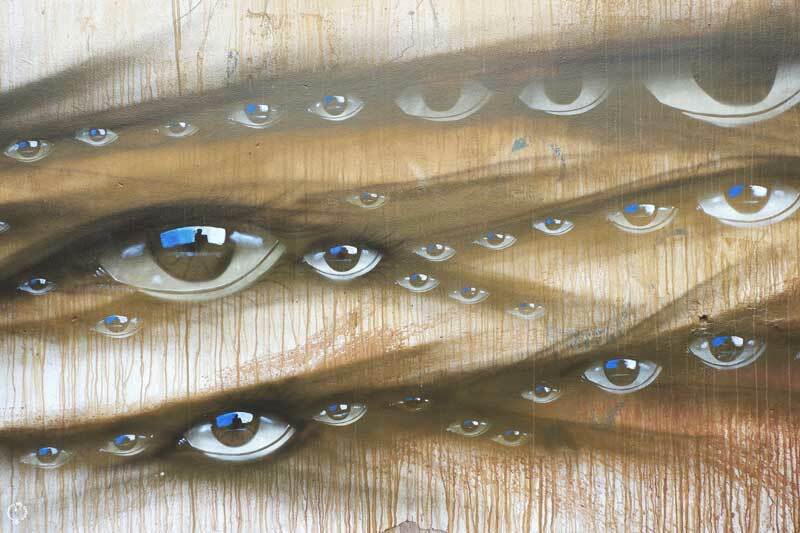 My Dog Sighs’ drops are captivating, yet very simple to create. It’s basically an irregular oval stencil painted half black and half white, and then the negative of that stencil is painted half white and half black. They are very quick to make, but keep in mind you can spend hours getting lost in them gazing! As for the huge bubble-letter tag on the shutter, he had to cover it to paint the surface in a color that would fit with the background of the mural. However, by painting only a single eye in the middle of the shutter, he left plenty of space for new tags to be added. I found the way he interacted with these tags not only smart, but also a clear sign of his English gentlemen’s behavior. It was a clear invitation of mutual respect for art’s sake. As soon as we entered the printing press, My Dog Sighs smiled. The pungent smell of paper and ink brought him back to his childhood, when he was visiting his father at his typography. He remembers the ladies quickly arranging the old-style characters to print the newspapers by hand. As for me, it was the first time I’d entered such a fascinating place, and I marveled at how the owner nailed the exact shade of color that My Dog Sighs needed to produce his first print ever. Everything was done so professionally and quickly that, after less than two hours, all the silkscreen prints were ready to move on to the next phase: the coloring. 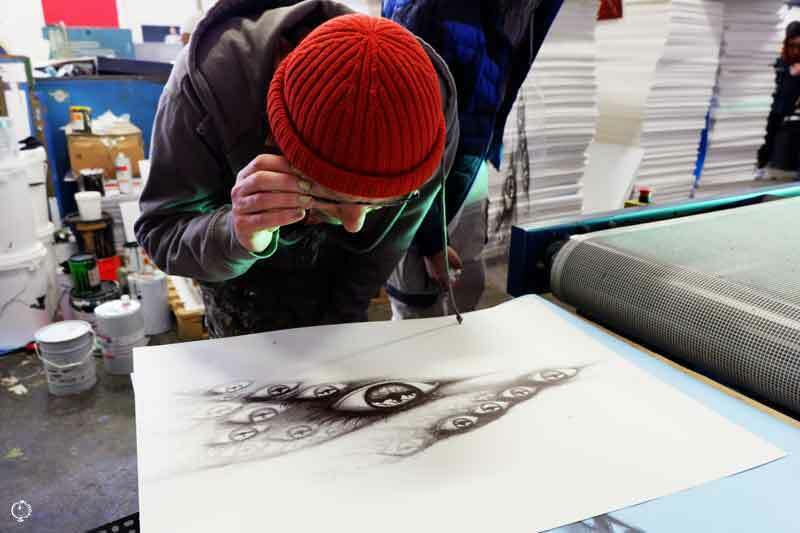 My Dog Sighs did heavy hand-finished prints (which, by the way, are available on Forgotten Project’s website), and he used the colors from the mural, enriching them with some mesmerizing dripping and details that are reflective of his artistry and also his signature style. At night, alone in my living room, he’d put his headphones on and begin to paint, whistling a song by The National that, from the next room, never took me too long to guess. 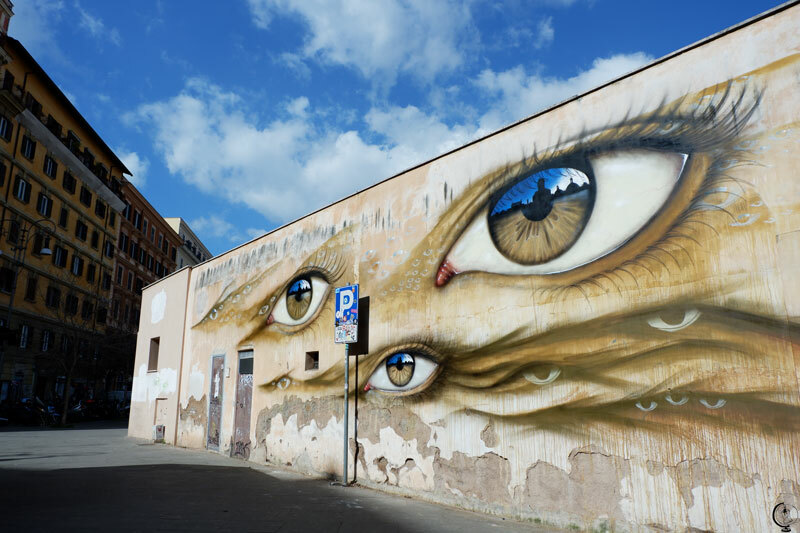 My Dog Sighs in Rome > Day 5: The Mural Is Done! 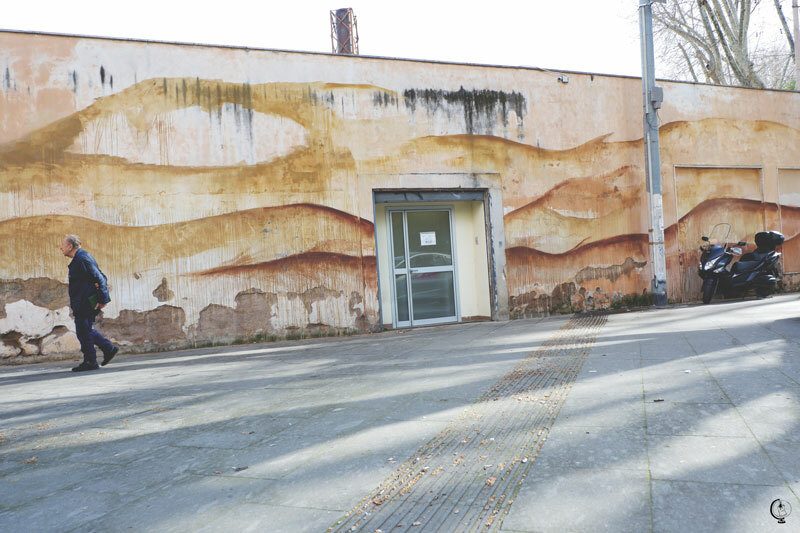 Of all the large-scale murals I’ve witnessed the making-of, this one turned out to be especially popular among the residents, who were stopping by every day to compliment the artist. The enthusiasm of the people was greater than ever, and although a lady found My Dog Sighs’ iconic eyes disturbing (and suggested him to paint kittens and flowers instead), the majority of passers-by loved the mural. “At last, there is someone keeping an eye on my kiosk!” joked the owner of the newsstand right in front of the wall. Passers-by also had a say on the recent changes undertaken by the Nuovo Regina Margherita Hospital. 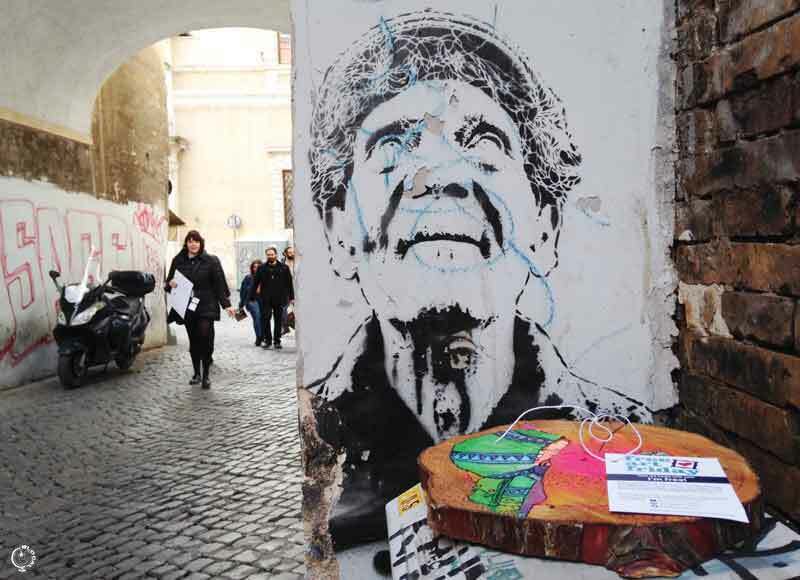 It is –in turn- the ultimate goal of Forgotten Project: highlighting those buildings in the city center of Rome that runs a risk of being forgotten. And so a lady, whose silhouette has been portrayed by My Dog Sighs by the highest eye, told us that she comes to the Nuovo Regina Margherita Hospital for check-ups. If the hospital closed, she’d be put on a longer waiting lists at bigger and busier hospitals, like the nearby San Camillo. 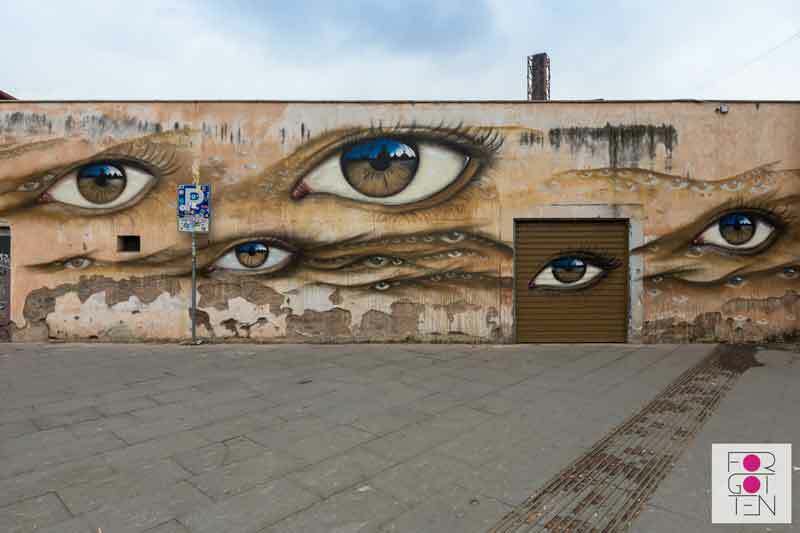 My Dog Sighs in Rome > Day 6: It’s Free Art Friday! “The first rule of Free Art Friday is that it doesn’t have to be on Friday” My Dog Sighs reassured me, as I kept receiving puzzled messages from both local artists and art lovers who were confused on when we should meet to hide the artworks around the streets of Trastevere neighborhood. Sure, My Dog Sighs began this kind of activity on Fridays, since Friday was the day on which he was going to work by train instead of by car, so he had the chance to hide his free artwork on the way from the train station to the school where he was working as a teacher. 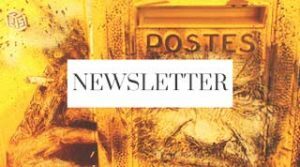 However, the movement he founded -which has spread internationally- now organizes Free Art Friday events regardless of the day of the week. Free Art Friday is for My Dog Sighs what graffiti writing is for most street artists: the first step within the public art realm, from which his overall artistic manifesto and professional career has begun. Popularity arrived after quite a few years of leaving free artwork in the streets, when one of his students made a short movie about Free Art Friday. It eventually won an award and was broadcast on the BBC. 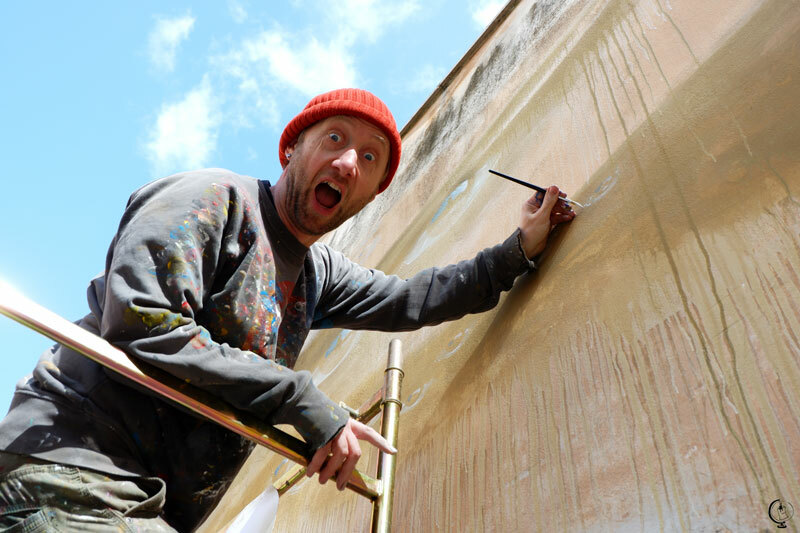 From then on, My Dog Sighs’ iconic cans, which he was –and still is- handing out for free every Friday, have become extremely popular. 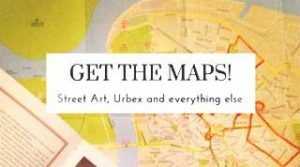 Thanks to the sudden window in the agenda of a well-known art gallery, they made it to a ‘proper’ art show and it sold out quickly. At first, he was painting only faces with closed eyes on cans. Then one day he painted one with open eyes and he loved it, although he messed up the nose and so he discarded the can altogether. 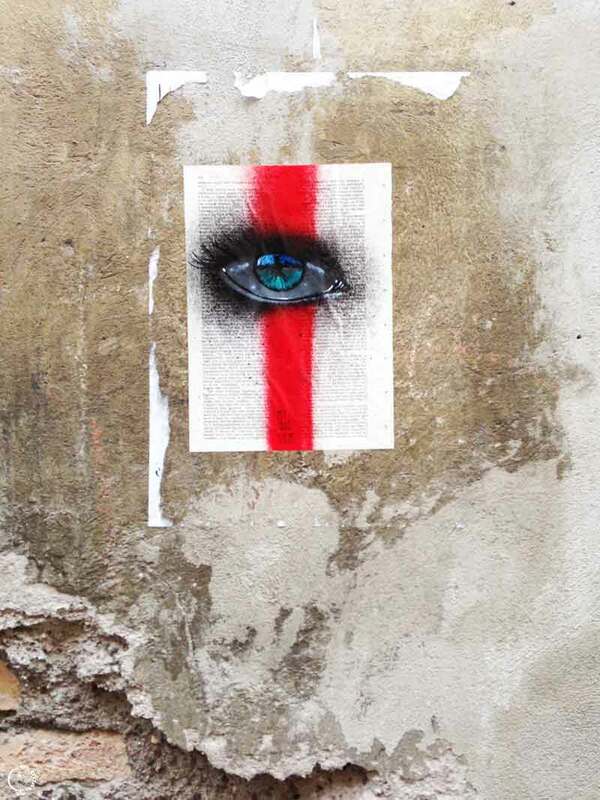 He came back to it after locking eyes with two veiled women on his way to an art gallery in East London; he was amused by their bright gazes and he painted a burka around the open eyes. 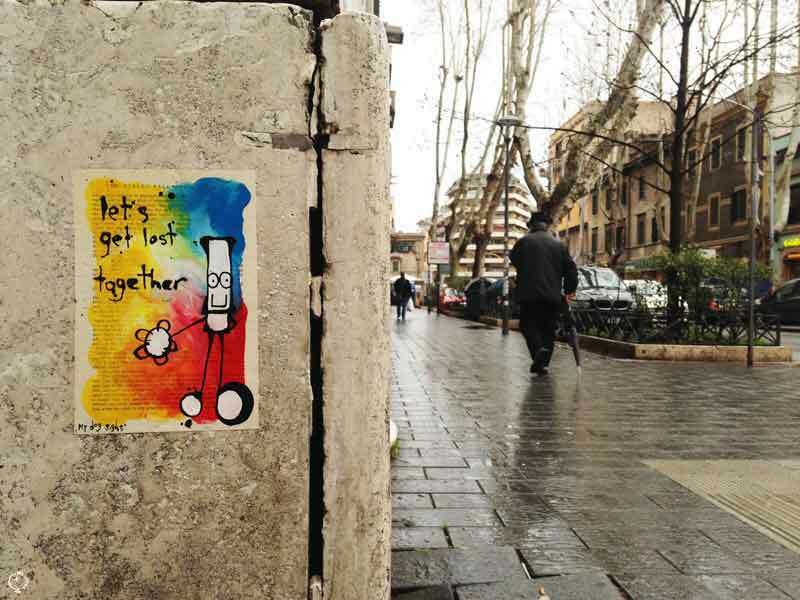 This can became extremely popular, and My Dog Sighs uses this anecdote as part of his happy-go-lucky theory. He believes that from every mistake a beautiful, innovative thing will arise. This is also why, when he is asked “What is the best piece you have ever painted?” his answer is always “the next one,” since he believes that from each piece of artwork you can learn something useful for the next one. His hand-painted recycled cans are what made him stand out, together with his iconic character ‘the Everyman.’ The idea for the everyman came from a portrait of him drawn by one of his kids at the kindergarten, which he transformed into a cute and extremely expressive –yet simplistic- character. The everyman is always sketched on a yellow-blue-red background and accompanied by some lyrics from My Dog Sighs’ favorite songs. 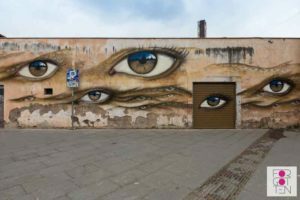 During his stay in Rome, My Dog Sighs left several everymen around the city, posting pictures on social networks for his followers to hunt them down and find them. All this said, the pressure to organize an awesome Free Art Friday event was huge, and the forecasts announcing a big storm on that Saturday didn’t help at all. 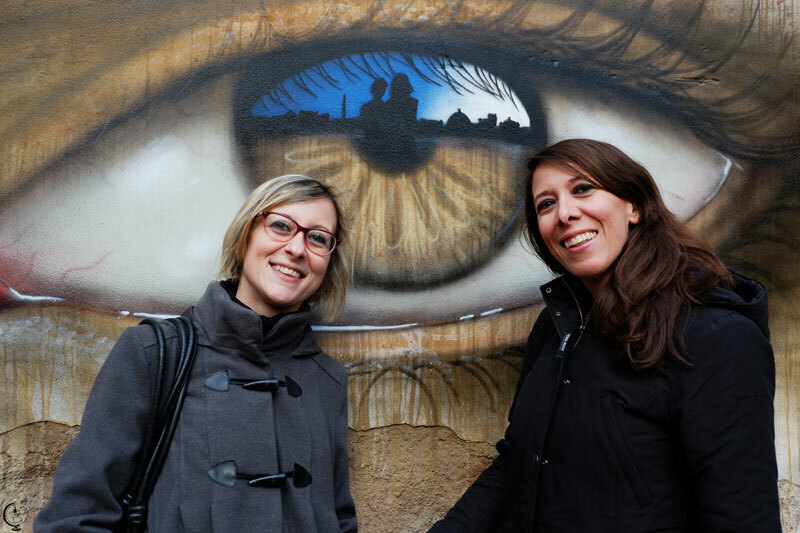 Luckily, the weather stayed dry and everything worked out for the best: there were more than 250 artworks scattered around Trastevere, and everybody- both local artists and participants- seemed to have a great time, sipping a beer in front of the wall while congratulating My Dog Sighs on the success of his first mural in Rome. 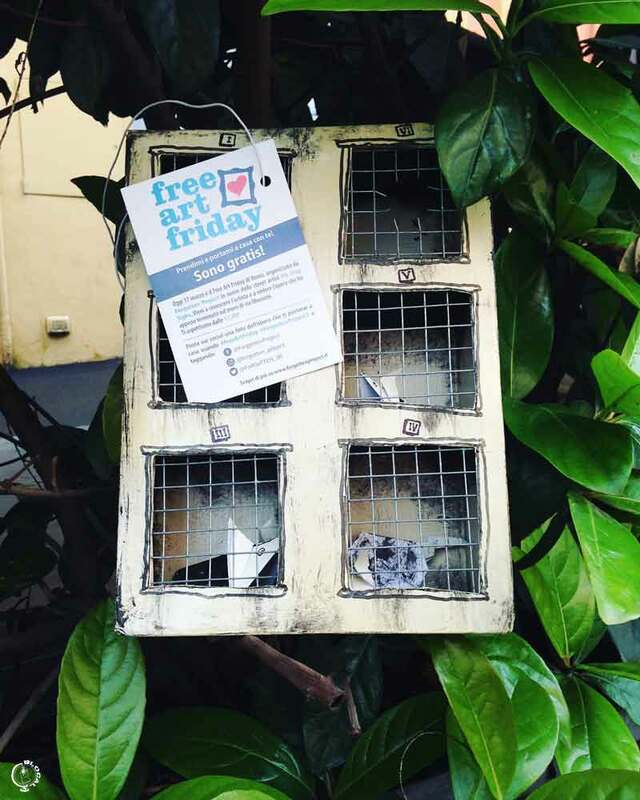 An artist meets with the person who found her artwork: That’s Free Art Friday! 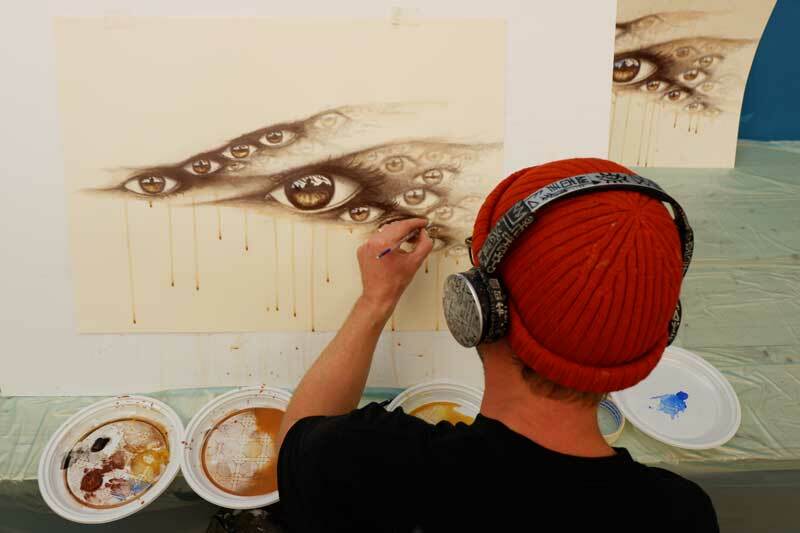 One more thing that made it extremely pleasant to work with My Dog Sighs was and is his upstanding work ethic. He would not call it a day until he had accomplished all that he had set his mind to earlier in the morning. 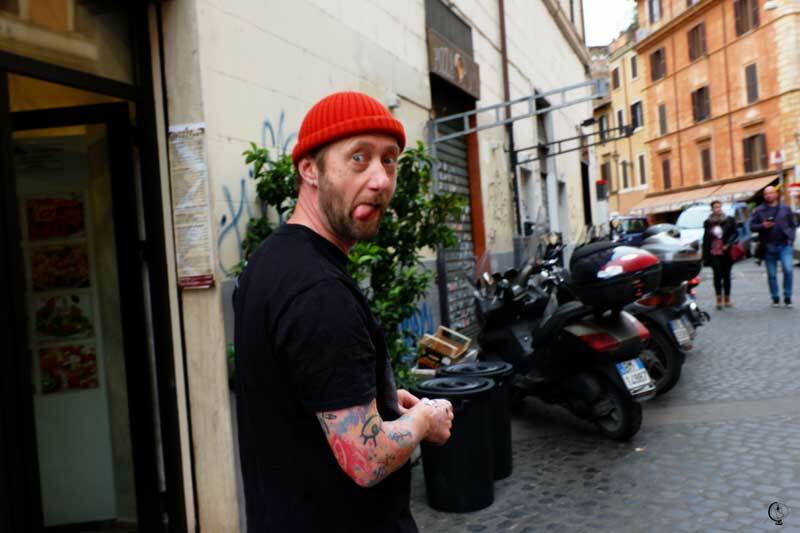 Despite it being his first time in Rome, he didn’t enjoy the city until he had (hand) finished the very last silkscreen print. Seeing us gawping in awe at his professionalism, he explained that it came from working for 20 years as a kindergarten teacher, where he learnt what does it means to show up on time every day and doing your best. 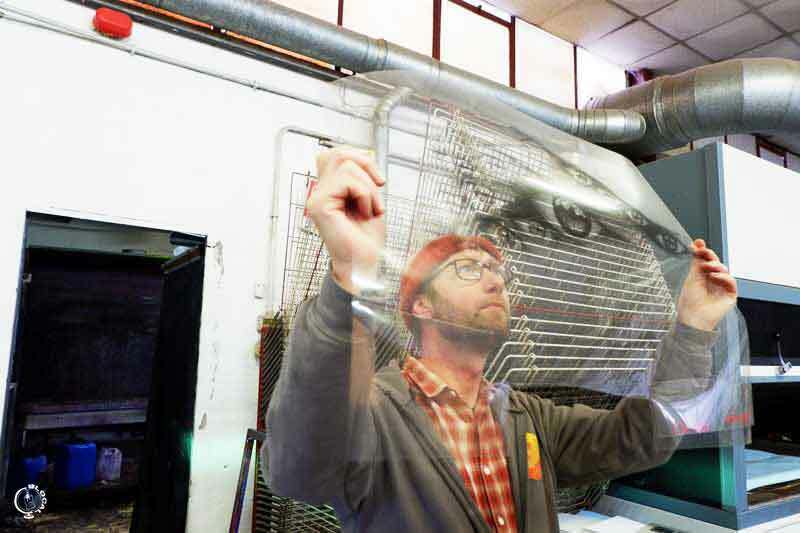 And even if he quit teaching five years ago to become a full-time artist, he still holds to that work ethic. It’s pretty unusual in a world where often the hardest work challenge is showing up sober at the wall. Or showing up at all. 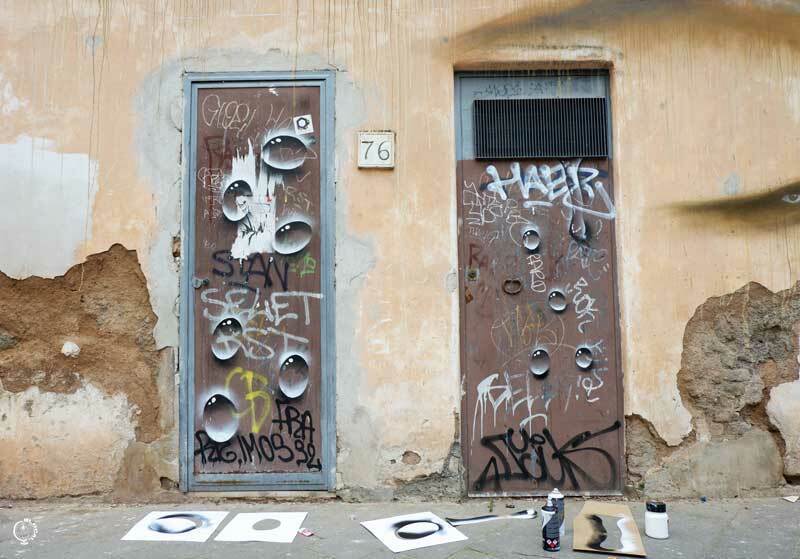 After working really hard at the wall first, and at the silkscreen prints later, My Dog Sighs eventually allowed himself to be a tourist and he got to explore Rome. We wandered around the city center, we tried artisanal gelato and craft coffees, we walked across monumental squares and marveled at Caravaggio’s paintings, we left stickers everywhere and checked out all of the monuments he only knew from stenciling them within the reflections of his iconic eyes. 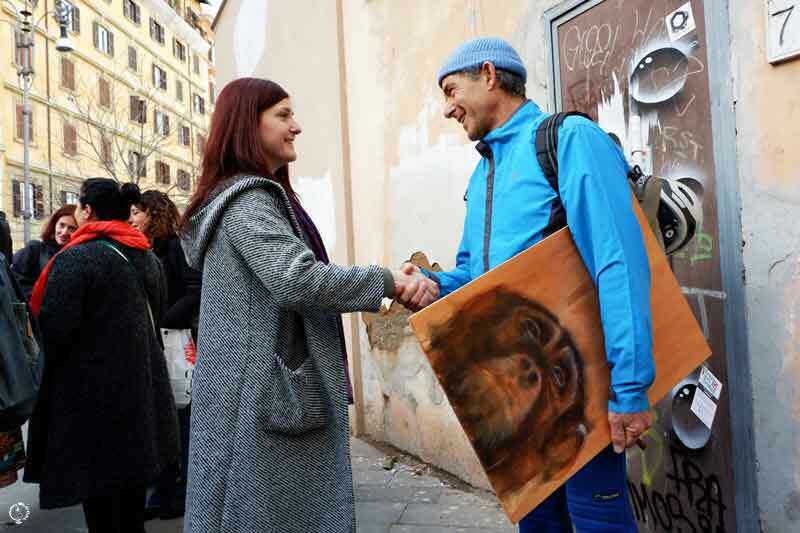 “The more I look around, the more I realize that I picked the right colors for my piece,” he told me at the end of our sightseeing tour of Rome. I couldn’t agree more! Thank you Paul for the amazing time! I’m looking forward to seeing you again! April Vlog: Hallo from Amsterdam!